This 7-8 seater hovercraft is powered by the very popular Polaris 120HP or 155 HP Cleanfire powered engine, with superb high power to weight characteristics. This engine has remote diagnostic software, and is extremely reliable. Notes: Some suppliers are a little economic with the truth about payload ratings, if you intend to go near water, all hovercraft create a pressure wave known as The Hump, and generally carry 50% less weight when starting on water (compared to on-land). Never ask hovercraft supplier – how many seats? Always check the on-water payload capability, to ensure you can get home. Check the weight of passengers and driver, additional equipment. Some conditions make starting on water more difficult, such as loading, wind strength, wind direction, and depth of water – deeper water is easier to start from. This new model released in 2015 is constructed from Carbon Fibre / Kevlar Composite with HDPE trim, we believe this is the first production hovercraft to be available in this material. You may be already familiar with the strength and lightweight properties of carbon fibre, and be aware that Kevlar is used for bullet proofing applications. Although a new model, all engineering components are already well founded and proven, common to existing models. As hovercraft are weight sensitive vehicles, construction of smaller hovercraft in the past has been from thin lightweight glass fibre that lacks durability. The carbon fibre / kevlar composite construction of this model will make it extremely hard to match, and very price competitive. Measure hovercraft value by dividing the price by on-water payload to determine the cost in $ per pound. Most 7 seater hovercraft tend to be very heavy – by exploiting the lightweight / strength characteristics of carbon fibre, the Carbon Infinity promises to deliver superior value for a wide range of applications. 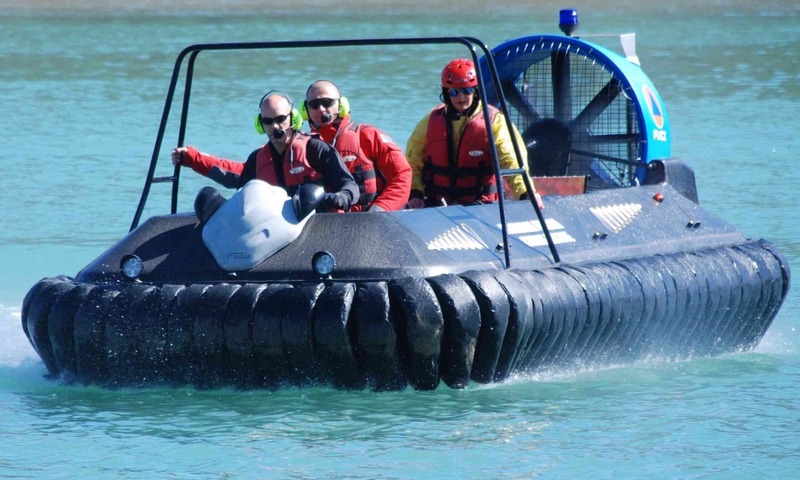 As there are so many different applications for hovercraft, we offer a wide range of options, with some rescue / commercial / military options not necessary for leisure use. For a detailed quote, please contact us and let us know how you wish to use the hovercraft (application) whether you can accept Excel files on your computer, where you live and what currency you wish to see (we invoice in pounds sterling). Colour is Carbon Fibre Black. We may offer camouflage and other colour variations, please enquire. The Hov Pod has segmented skirts so that if you damage one section, just that segment can be replaced, rather than the whole skirt, so this reduces running costs. We rejected the materials other suppliers use – we tested neoprene coated nylon but found this degrades when exposed to UV or sunlight. We also tried Hypalon, but found this to tear too easily – we don’t want to make money through providing frequent replacements. We don’t want to saddle customers with frequent shipping costs. We now fit Polyurethane coated anti-rip nylon weave 375 Gsm skirts, and supply these to customers with hovercraft purchased from other suppliers. The Hov Pod skirt design and air management system is designed to prevent ploughing problems – we don’t say ploughing is impossible on a Hov Pod, but we do try to prevent ploughing issues. Request our buyers guide if unfamiliar with hovercraft characteristics and terms such as ploughing and hump.